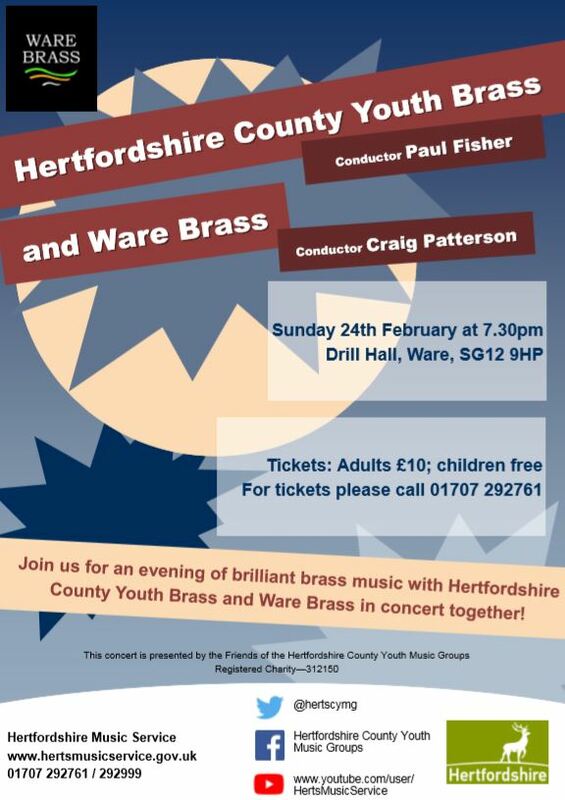 Here is the programme for the Ware Brass part of our joint concert with Herts County Youth Brass. Come along and enjoy …. Please join us on Sunday 24th February at 7:30pm in the Drill Hall in Ware for our joint concert with the fantastic Hertfordshire County Youth Brass. Tickets are only £10 for adults and the kids go free !! Call 01707 292761 for tickets and more information. Ware Brass – Dates for your Christmas Diary…. Make sure you add both Saturday 15th December and Sunday 23rd December to your Christmas calendar. Ware Brass will be playing their annual Christmas Concert in St Mary’s Church, Ware on Saturday 15th December at 7pm. 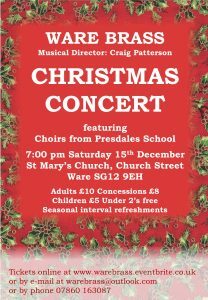 This year the concert will also feature choirs from Presdales School. The music will be full of festive flavour to get you in to that Christmassy mood. 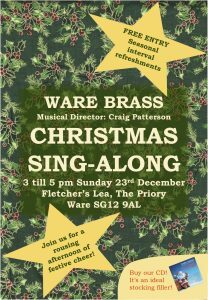 Seasonal refreshments will be served at the interval where you can also take this opportunity to buy the Ware Brass CD Christmas…. At Last! What better way to wake up on Christmas morning and have the band play for you! On Sunday 23rd December, it is our annual Christmas Sing along in Fletchers Lea from 3-5pm. Admission is Free, so come along and sing your heart out to all your favorite Christmas carols. Ware Brass is renowned for their November Spectacular’s and this coming November is one of the more poignant. The band will be using this year’s event to commemorate the end of World War 1 as well as music from other times that our great nation entered war. As you can imagine, preparation is underway for a great night of War & Peace on Saturday 17th November. Not only will the band perform musical numbers including The Dambusters, Army of the Nile, Hymn to the Fallen and music from the film Schindler’s List but it will also feature the vocal talents of Tom Huttlestone and Caroline Patterson. A musical collaboration to celebrate twinning featuring . . . .
On Saturday 30th June 2018 Ware Brass will be giving a joint concert with the Swing Parisis Orchestra at St. Mary the Virgin Church, Church Street, Ware, SG12 9EH. Concert starts at 19:00 and entry is FREE !! If you would like to get in touch, whether to book the band for a concert/event, looking to join or are interested in coming along just for an evening, then contact our band secretary, Mark Huttlestone, by email here or by telephoning him on 07761 717759. We rehearse on Monday evenings at the High Cross Village Hall, North Drive, High Cross, Ware SG11 1AN, from 8.00pm to 10.00pm. You can see a map of the location here.